The coast of Rhode Island is home to gorgeous beaches, charming seaside towns, coastal wetlands, and a unique ecological feature called “coastal salt ponds,” or wetland estuaries that provide valuable habitat for an array of wildlife. Ninigret Pond in Charles Town, Rhode Island is the state’s largest coastal salt pond. The Pond and its surrounding salt marshes are a resource situated between the residents of Rhode Island and the cold waters of the Atlantic Ocean, serving as a natural buffer to storms. 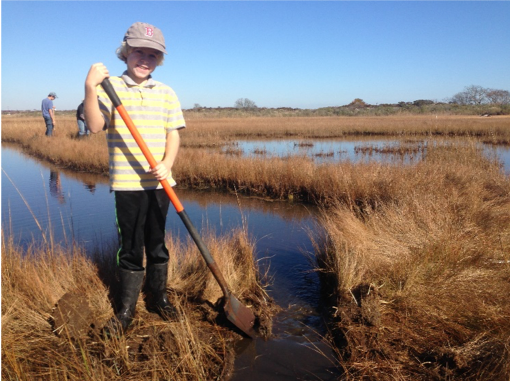 Several years ago, in 2014, scientists studying the area observed that the salt marshes at Ninigret Pond were starting to drown, essentially transforming them into mud flats. Funding from the National Fish and Wildlife Foundation’s Hurricane Sandy Coastal Resiliency Fund made it possible for the Rhode Island Coastal Resources Management Council to step in and work to restore and enhance the existing salt marsh in an effort to bring back native species as well as protect the community from coastal flooding. 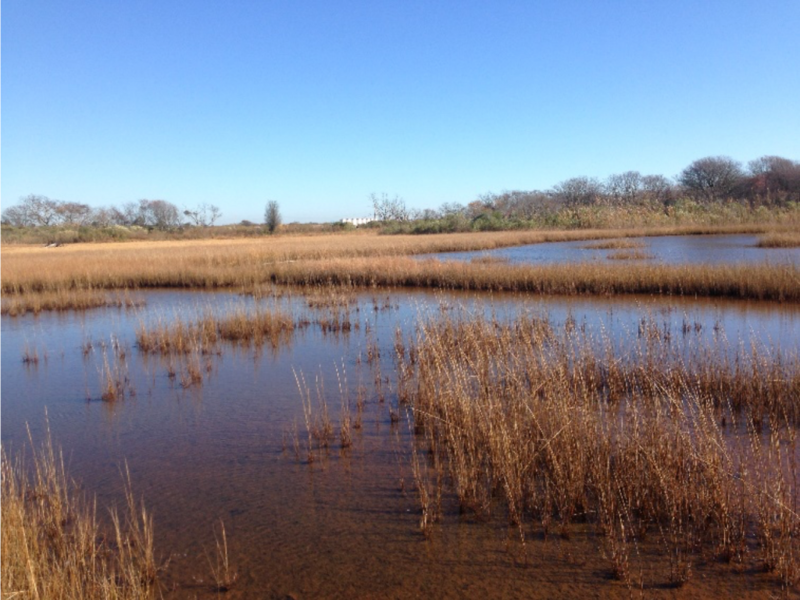 The CRMC, a Rhode Island state agency, and its partners developed a plan to use sediment from the nearby Charlestown Breachway to build up the elevation of the marsh to create a new surface to restore the coastal salt pond. The contractor for the project, JF Brennan Company, dredged the waterway and deposited the dredged materials on the marsh throughout December 2016 into January 2017. They then spread the materials out over the marsh and leveled the new surface. Teams of volunteers from Save the Bay came to Ninigret Pond to plant thousands of native plants, sourced from the New England Wildflower Society, on the newly deposited material on the marsh. “It’s been a great opportunity for us to engage volunteers and educate them on the importance of coastal marshes,” said Wenley Ferguson of Save the Bay. Save the Bay has been involved in the monitoring and adaptive management of the upgraded marsh. Ferguson lead a team to build a drainage network in the salt marsh to allow groundwater and precipitation to flow out of the marsh. Save the Bay volunteers have spent the last six weeks planting approximately 23,000 plants, adding to the 48,000 beach grass plants that were planted last year. It was essential for Chaffee and the team to understand the water levels and vegetation patterns at Ninigret Pond before the restoration project started. The dredging technique used at Ninigret Pond is common for marsh restoration work in Louisiana, but this project was the first of its kind in New England. Chaffee is now touring the area educating conservationists on the technique. “Everyone is really interested in our results,” Chafee said. The team from Save the Bay is managing teams of volunteers who are monitoring the results of the restoration. They are recording bird and fish species spotted at Ninigret Pond, as well as the tidal flow in the area. “Things are really coming back and it’s exciting to see,” said Ferguson. “Save the Bay has been an invaluable partner for us,” Chaffee said.